I can only assume that this article was put out by the IDA or some agency connected to the IDA for the simple fact that the same article was published by a few different websites. Here are a few other articles. “Two million people visited the Arch replica in just two days. 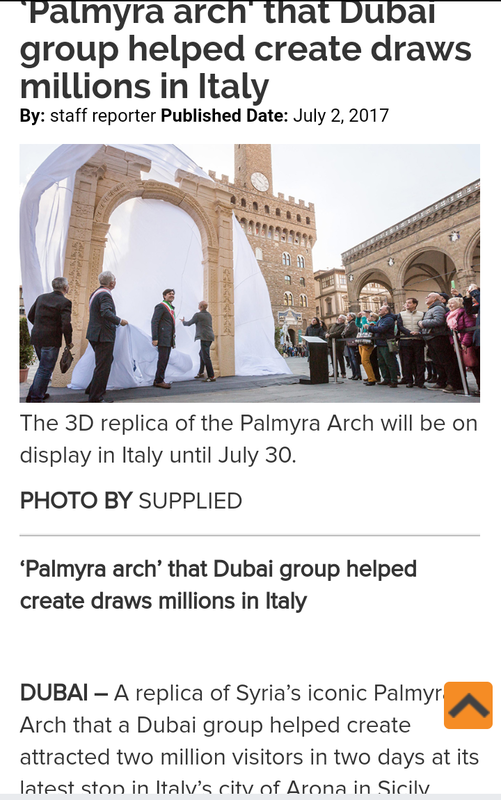 The replica was created in Italy by the IDA, Harvard University, and the Dubai Future Foundation, and is expected to attract thousand.” (https://3dprint.com/179081/palmyra-arch-in-italy/) Now I find it hard to believe that the Arch in Arona had 2 million visitors in 2 days for the simple fact that the opening night had an estimated 5,000 people that attended. 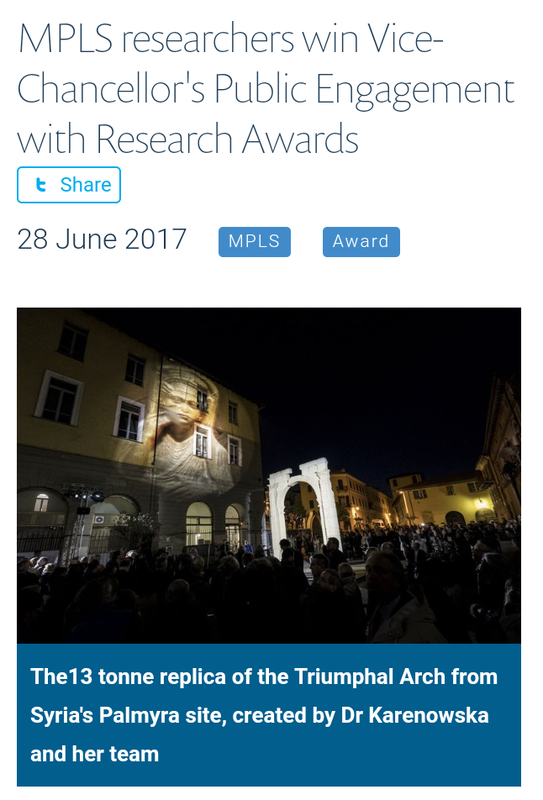 “An impressive ceremony organized by the Municipality of Arona (Piedmont, Italy) has veiled of tears the eyes of the 5,000 people who gathered in Piazza San Graziano and saw the 3D reproduction of the Arch of Palmira.” (http://www.qualitytravel.eu/en/latest-news/the-arch-of-palmira-unveiled-in-arona/52420) I’ve seen alot of videos of the unvieling in Arona and it looked far from 5,000 people. I could be wrong though. Now I couldn’t find one mainstream media source that wrote about this 2 million visitors in 2 days claim. 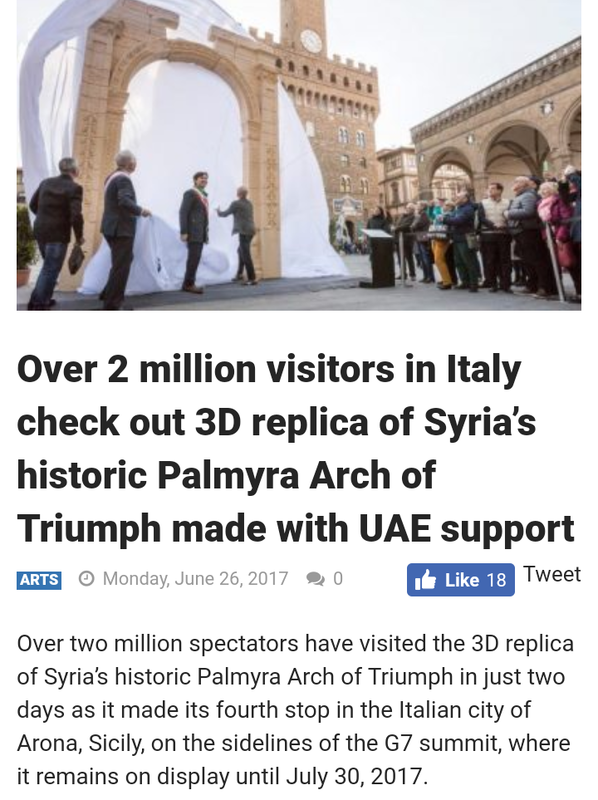 Like I said, there were only a few sources and the few that posted it were obscure sites line this one (http://expatmedia.net/2017/07/02/palmyra-arch-dubai-group-helped-create-draws-millions-italy/). Now what would be the reason as to why they would make a claim Like 2 million visitors? 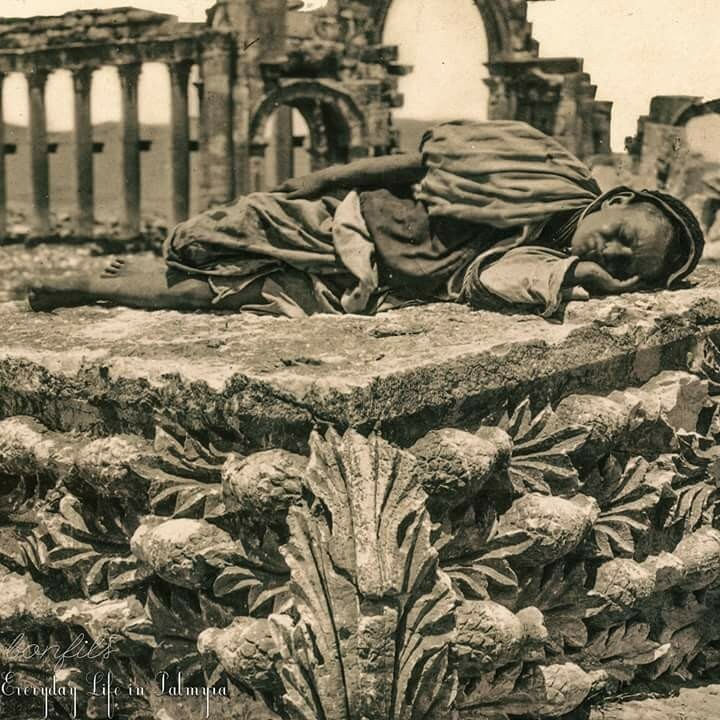 Its been said that 150,000 people visited the Arch in Palmyra when it was still sqanding. And there have been hundreds of thousands of visitors when it was in the other 3 sites prior to Arona. So why 2 million in 2 days? What do we make of that? I can only speculate and say that the numbers might be fudged just a little bit. Maybe because they want people to think that 2 million people were “Passing through and moving forward”, just like the slogan for Arona said. Who knows though, maybe it was actually 2 million visitors in the first 2 days. I highly doubt it though. Another story that recently came out was the British Council giving $140 million dollars to the Preserving Syrian Heritage Project. You can read the story below. It seems like alot of money just for documenting sites or artifacts digitally don’t you think? So I just happened to look up Ms. Karenowska and her history and I thought it was pretty intetesting for her to get this award. Here is her bio on her blog. 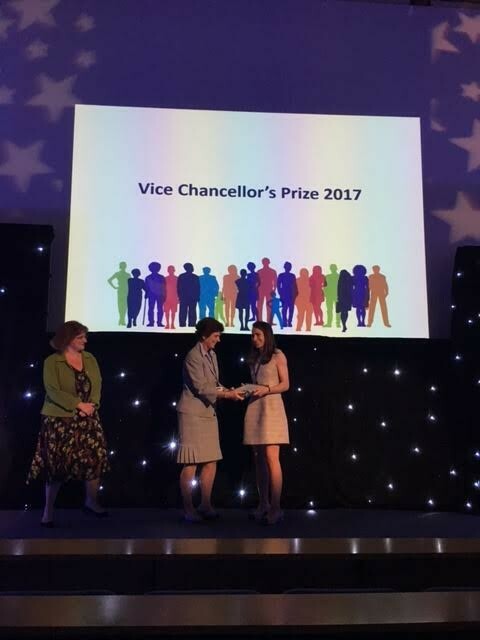 “I am a magnetician with a research group based in the University of Oxford’s Department of Physics, and a Fellow by Special Election of Magdalen College. My main research is in the properties of magnetic systems. Specifically, I am interested in the quantum-level investigation of spin-wave systems: an area of study known as quantum magnonics. A spin wave is an elementary excitation of a magnetic system — essentially a kind of magnetic wave which can propagate at high speed through certain kinds of magnetic material. Like light, spin waves can be thought of either as waves, or as streams of “quasi-particles”. The spin-wave quasi-particle is called the magnon and it carries a quantum of spin-wave energy. The study of spin-wave systems at the quantum level provides both interesting new insight into the physics of magnetic systems and a potential platform for novel kinds of microwave-frequency quantum information processing. Alongside my work on spin-wave systems, I am Director of Technology at The Institute for Digital Archaeology, an organization dedicated to finding innovative technology-driven means to document and preserve heritage material. My work is focused particularly on the application of 3D printing and machining technologies to the restoration or replication of damaged or destroyed archaeological structures and artefacts. This work combines aspects of applied electromagnetism with electrical, optical, and mechanical engineering. Here is her Bio from the IDA website. “Since 2015, I have been Director of Technology at The Institute for Digital Archaeology (IDA). I work with the Institute’s founder and Executive Director, Roger Michel and international partners such as UNESCO, and Dubai’s Museum of the Future on the development of innovative technology-driven means to document and preserve heritage material. I have a particular interest in the photographic study and documentation of cultural heritage objects and the application of 3D printing and machining technologies to the restoration or replication of damaged or destroyed archaeological structures and artefacts. This work combines aspects of applied electromagnetism with electrical, optical, and mechanical engineering, and also involves the development of dialogue about what cultural heritage is, what it means to today’s society, and how we can work as an international community to preserve it. I manage technical aspects of the IDA’s large-scale open-access international database project, The Million Image Database. The database, which targets the collection of images of cultural heritage sites around the world, can be accessed here. I also direct the IDA’s work on the development of 3D print and machining based reconstruction technologies and over our on-site reconstruction initiative. 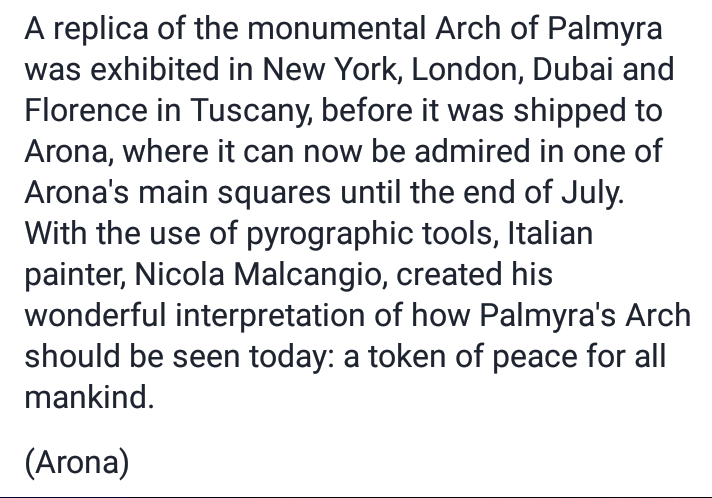 In April 2016, I managed the IDA’s installation of a monumental-scale replica of the Triumphal Arch from Syria’s Palmyra site on Trafalgar Square in London. This structure was produced by a combination of photogrammetry-based 3D computer modelling and state-of-the-art 3D machining in stone. You can find out more about the installation here and the manufacturing process here. 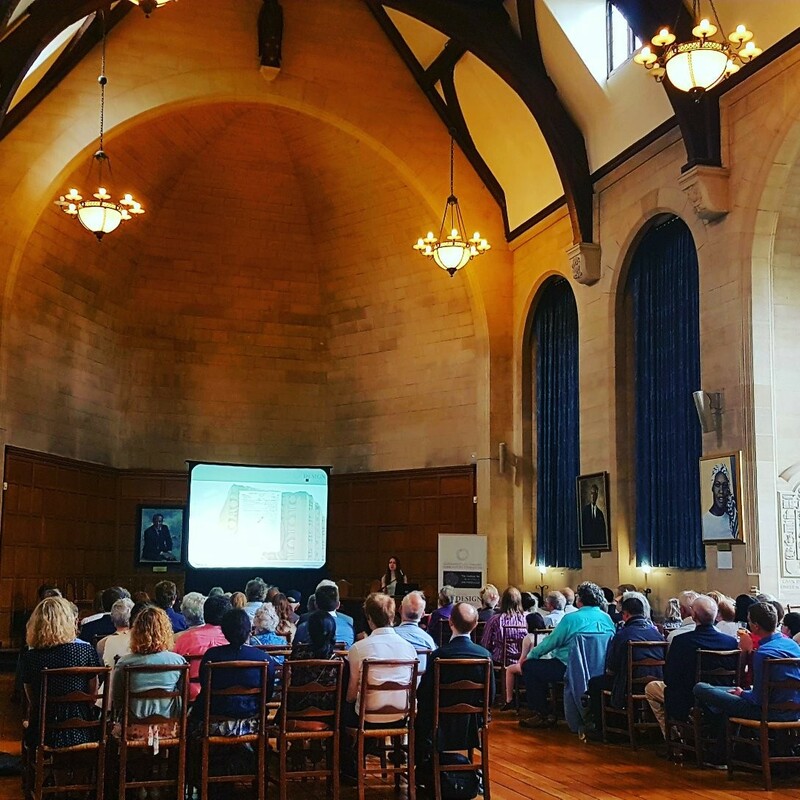 The event was covered by media organisations across the world — selected articles and documentary footage can be accessed here. So I don’t find it strange that this lady got these awards for working with the IDA. I do find it strange that she is a physicist and was in charge and overseeing the building of the Arch and the setting it up at all for locations. From the very get go I presumed that this Arch was like a beacon of sorts sending a signal out to the spiritual realm. This was based off of all my research. Then at the end of May when the Arch was set up in Arona, Roger Michels came out and said that the Arch was “like an antenna of sorts”. This blew my mind because he finally admitted what it actually was. I said beacon while he says antenna. Basically the same thing. It was something that was sending off a signal and/or receiving a signal back to it. To where, your guess is as good as mine. I suspect to the likes of Saturn, Jupiter and Venus. And to understand what I’m saying exactly, you need to have read all my other papers that lead up to this conclusion. She mentions that one of her main studies is in Quantum Magnonics. What is Quantum Magnonics exactly? “The field of magnonics is the area of magnetics dedicated to the science of quasi-particles known as magnons. In certain magnetic systems, magnons are able to play the role of microscopic tokens which can carry ‘spin’ — the quantum mechanical currency of magnetism — over relatively long distances (up to centimetres), and at high speed (many tens of kilometres per second). My research group in the Department of Physics at the University of Oxford develops low-temperature microwave magnetic circuits to probe the physics of magnonic systems at the quantum level. The bulk of our work is done in a purpose-equipped dilution refrigerator in which we conduct measurements at millikelvin temperatures. Our interests also span the related field of magnon spintronics. Spintronics is the area of research dedicated to the study of how spin can be used realize new types of information transport, storage, and processing system which surpass the capabilities of those found in today’s consumer electronics. Magnon spintronics is concerned with structures and devices which involve the passing of spin-information between magnons and electrons. Such systems are a rich source of new physics, showcasing the subtle interplay between magnonic and electronic transport and, in so doing, opening doors to electronic devices with novel and exciting functionalities. “The term “magnon” refers to the quasiparticles of spin waves and explains why this field of research is being called “magnonics.” In contrast to spintronics, which only makes use of the electric charge as a property of electrons as well as its spin moment, magnonics employs spin-wave excitations in magnetic materials. So obviously I’m not a physicist as could use some more help here on translating all of this. But I do know this, it deals with solid state physics and a good example seems to be something like a hard drive or compact disc. Now I find it interesting that the woman who was in charge of building the Arch and oversaw three installations is in the field of Magnonics. And based off on what I mentioned above and quantum magnonics, is this type of quantum physics related to the Arch and it being a sort of antenna as Michel put it? 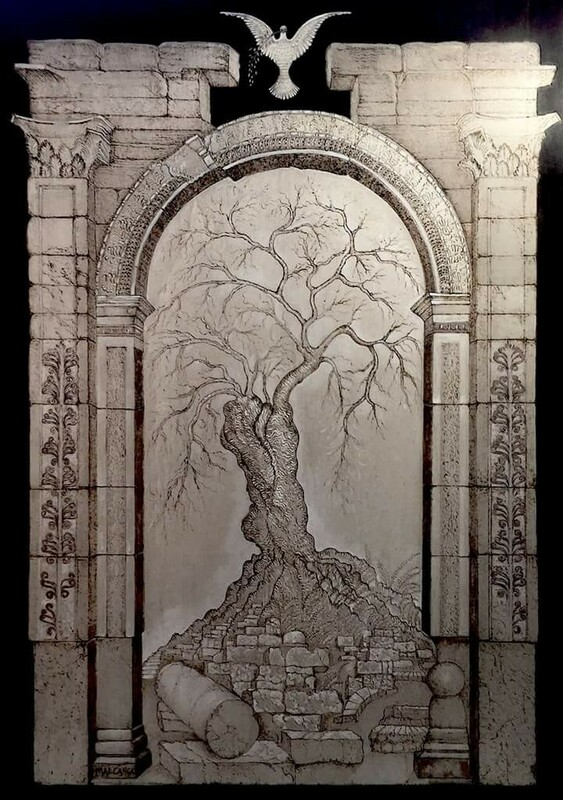 We know that some rocks and minerals have magnetic properties but would something like the replica of the Arch of Triumph have these sort of properties? Read this about magnetism and planets. Now notice that they say its made out of SEVEN (completion) blocks of this Egyptian marble that were used. I had also read that Egyptian marble wasn’t exactly their first choice. “The decision to build it in Egyptian marble – which they claim will be close to the original in appearance – was also a late one.” There are actually different kinds of Egyptian marble so I’m not actually sure what kind it actually was. 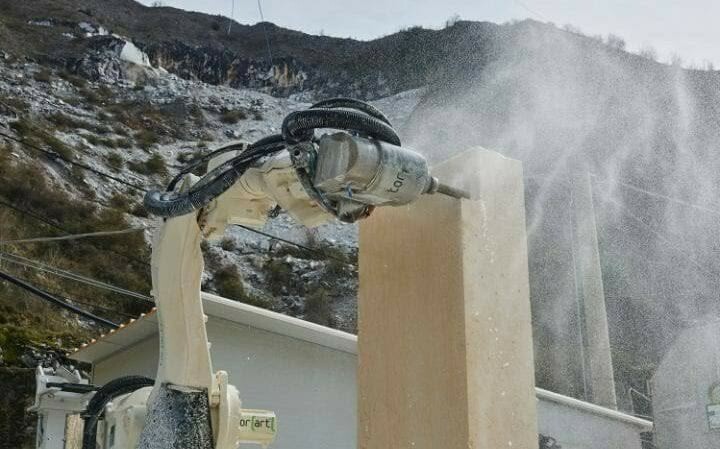 I’ve emailed the quarry in Italy that made the Arch and the company Tor[art] but haven’t gotten any reply back. 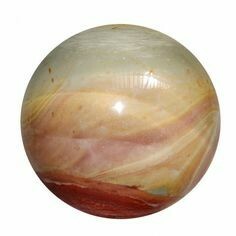 I haven’t had much luck on Egyptian marble but I did come across this. 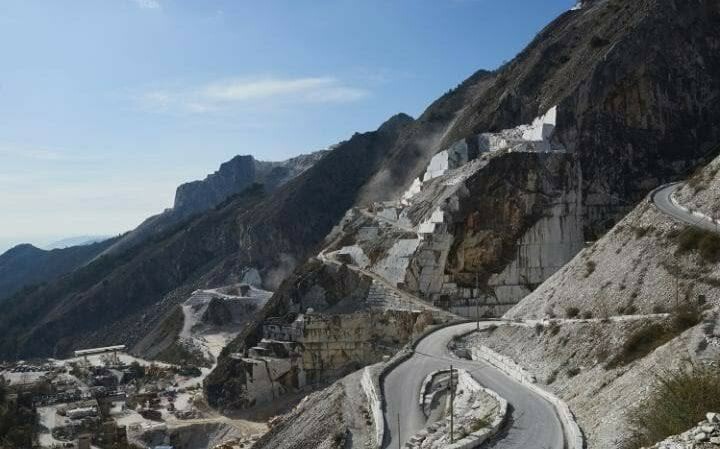 “Carrara marble is one of the most famous Italian marble in the world. Giving Egyptian marble this name indicates that this Egyptian marble resembles the Italian Carrara but with a black color. It is noteworthy to mention that Carrara is by default white.” (CHARACTERISTICS OF THE MARBLEINDUSTRY IN EGYPT By Azza I. Kandil and Tarek H. Selim) So according to this, Carrara and Egyptian marble resemble each other and I’m not sure if they can be used interchangeable. We do know that the Arch was made at a Carrarra quarry in Italy so maybe these two are interchangeable. I did come across where Brown Jasper which is found in Egypt, ironically is known as Egyptian marble. This is interesting because of the properties in Jasper that the occult uses. Jasper was also mentioned in Revelation 21:18 for the walls of the New Jerusalem. I didn’t see these as literal walls but I found it interesting if this Arch is somehow connected to Brown Jasper. So I’m not saying the Arch is made of Brown Jasper which is called Egyptian marble but there are a lot of occult influences with it. So the question is this…why is this woman who is a physicist in quantum magnonics in charge and overseer of the Arch of Triumph? Is there some sort of magnetism there with the Arch? CERN is all about magnetism. Is there a connection between CERN and the Arch? CERN seems to be connected with a lot of the activities going on lately.